First thing to do is clean your scissors properly. If you have used them to cut sticky items like tape, you get transfer which interferes with the blade edge. 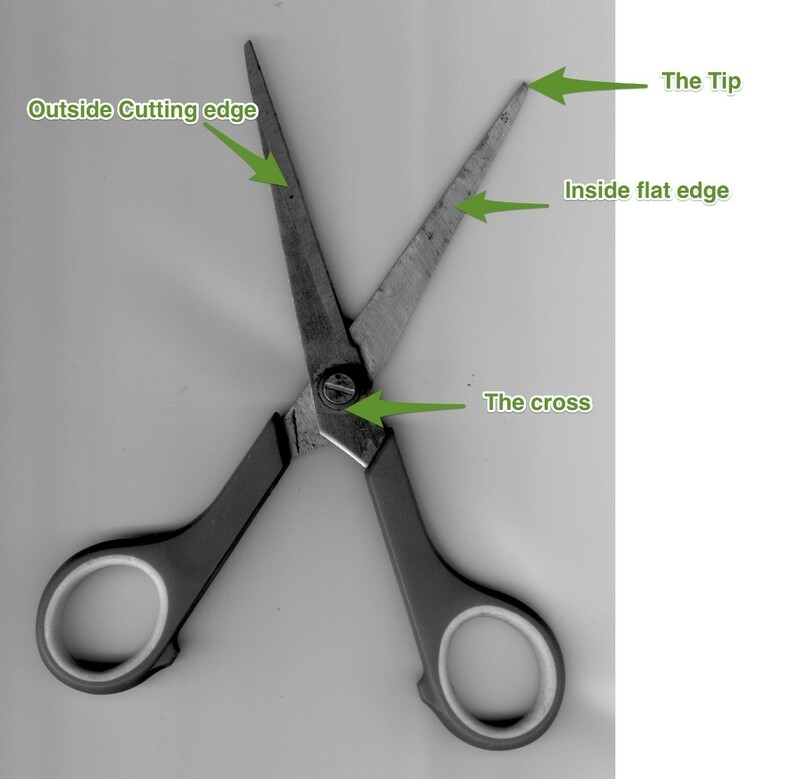 The next thing to know is that you only sharpen scissors on the outside or angled edge. Sharpening on the flat inner edge will eventually create a gap between the blades. Take a ceramic coffee mug and turn it upside down, notice the rough, unglazed ring? That's the best surface to sharpen any blade. 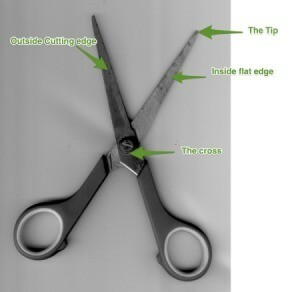 Open your scissors, hold it firmly where the blades meet(the cross), without touching the cutting edge. You sharpen on the edge with the inner flat side up, from the cross outwards to the tip. is flat against the cut (At about +/-75 degree angle). Pull the blade quickly and lightly across the ceramic edge, 3 or 4 times (or more depending on how blunt). Turn the scissors over and repeat. As you sharpen, you will see the steel discolour the ceramic edge, every now and then, turn the cup to get a clean section. Lastly, very, very lightly, run the flat inner edge of the scissors across the ceramic edge to remove any burrs. Good quality or very old scissors have a much wider cutting angle, giving the blade a sharper cutting edge. If you don't line up the cutting angle of the blade with the ceramic edge correctly, you will change the angle of the blade and eventually ruin your scissors. The finer the ceramic, the better the edge. If you want to really give a blunt pair of scissors a great edge start with a earthenware cup, then ceramic, and finish with porcelain or bone china. To take the markings off the bottom of the cup, buff it quickly with a piece of very fine sandpaper or a glass nail file.